Maidawan Corbett Homestay is a perfect getaway situated near some famous tourist spots like Corbett National Park, Ramnagar, Lansdowne etc. 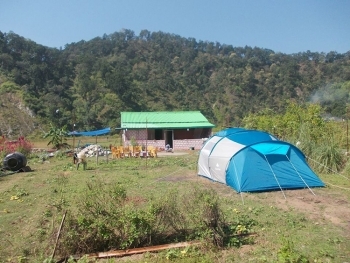 The homestay offers a budget friendly rooms and camps for solo and group travellers. The homestay is perfect place located amidst the natures solitude offering the landscape views of forests, step farms, rivers, waterfalls and rich wildlife, flora and fauna. The homestay is pet friendly and boasts rural tourism with long lists of adventure activities like trekking, hiking, village walk, waterfall, temple visit apart from river activities in Mandal river. Jungle safari and other activities at Corbett park could be done with an hour distance from the homestay. 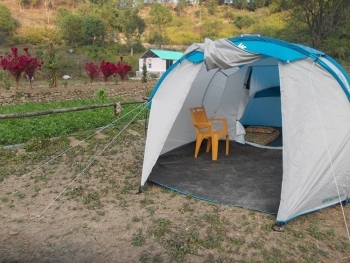 The homestay is located near the river at village Khadrasi, situated near Haldukhal on the Ramnagar - Lansdowne road. Some of the best sightseeing places near the homestay are Corbet National Park, Lansdowne, etc. The homestay a Master Cottage with 2 rooms and a separate cottage and camps to accommodate 25 person at a time. All accommodation offers basic amenities with clean beds and bathroom. The homestay serves delicious breakfast, lunch and dinner. The experienced cook serves delicious cuisines to the guests. Best way to reach at homestay is by road via Ramnagar or Kotdwar. One have to hire taxi from Ramnagar (90 kms) or Kotdwar (72 kms) to reach at homestay. Regular buses are available from Delhi to Ramnagar or Kotdwar. Nearest rail head is Kotdwar or Ramnagar and nearest airport is Jollygrant Airport at Dehradun (177 kms) or Delhi airport (294 kms).